I read to my daughter every night before bed. Last night, after months dedicated to a gazillion-paged fantasy adventure trilogy, she asked to return to a book that I used to sing to her when she was small. 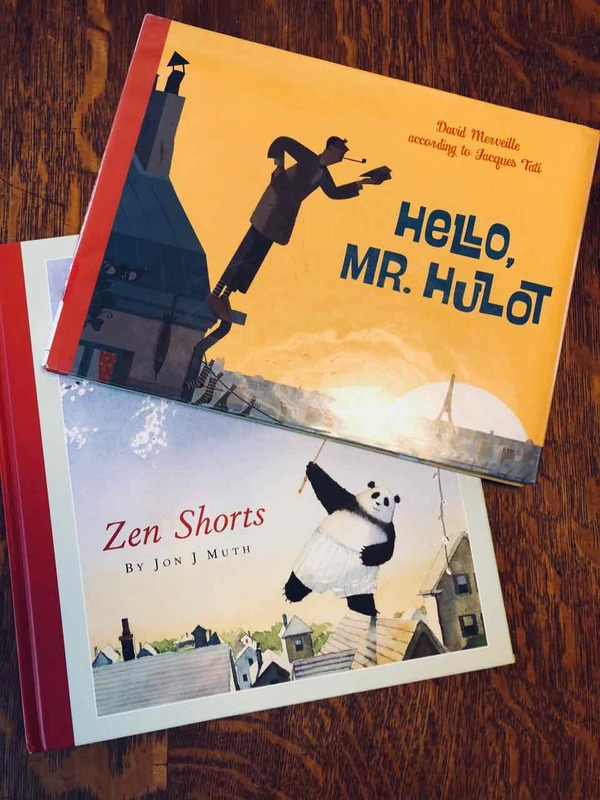 Hello Mr. Hulot by David Merveille is a picture book, so instead of reading, I hum our soundtrack (the tune of Tom’s Diner, by Suzanne Vega), and make up the stories for each of the situations in which the main character, Hulot, finds himself. When we got to the one where he imagines himself as Don Quixote, I set down the book and found a YouTube video of The Impossible Dream, from the Broadway musical, Man of La Mancha. This took us off on a tangent of watching every song performance from the play — a worthwhile mommy-daughter diversion, for sure. Oh, but it is for kids. It’s for everyone. Thanks to another children’s book, Zen Shorts by Jon J. Muth, Hazel is familiar with the Buddhist tale of “Maybe.” In this tale, a farmer experiences a series of events that his neighbors deem “good luck” or “bad luck,” to his insightful response, “maybe.” His horse runs away – bad luck – but then comes back with two other wild horses – good luck. His son tries to ride one of the wild horses, and falls off and breaks his leg – bad luck – but then is saved from being conscripted to fight in a war – good luck. I reminded her of this story, and then of the fact that we all plan our lives in order to learn important soul lessons. What may seem awful or painful or devastating may seem so hard in the moment, but we learn from these experiences, and getting through them makes for a rewarding soul journey. Don Quixote was a socially spurned kook. He lived a full-blown fantasy life of love and honor and courage, which was highly unpopular among the people of the “real” world. However, instead of being worn down by others’ scorn and derision to find himself among the lowest common version of humanity with them, he was able to spark a recognition of greatness within them, and to raise them, instead, to his world of beauty. And yes, it took his dying to do this. The thing about our lives is that we do never know what will happen next, but we can be confident that we planned the challenges that we will face in this life to learn the lessons of our choosing. We are all on an adventure rivaling that of the most intrepid explorers of all ages. It’s our own journey of learning and growing and empowering and loving. How we react to and learn from the events along the way is completely up to us. How we think about them is of our own choosing. Bad luck. Good luck. Happy ending. Sad ending. Maybe. When we look at the big picture, there’s always more to see. The most liberating focus is through the lens of love. Our hero died. The people lived. And what a happy ending it was. Soul Evolution Workshops: Get your crazy life, I mean driving, back in control.